Worm composting bins can be constructed in minutes, and provide a great way to reduce your household waste while producing useful and nutritious compost for your houseplants or outdoor gardens. Worm composting can be done indoors and even in small spaces. With a few low-cost materials, you can soon have worms taking care of your trash for you. This project is fun for families, too, with the wriggly worms teaching us how nature processes what looks like garbage into fuel for life. Put the shredded newspaper in the bottom of the container. The newspaper is bedding for the worms. Add the garden soil, and leaves if using, to the newspaper; the soil helps the worms digest the food scraps you’ll feed them. Moisten the newspaper, soil and leaves mixture in the container. It shouldn’t be soaking wet, but damp. Worms must have moisture to live, and if you let their bedding dry out, they will die. Place the worms on top of the mixture in the container. 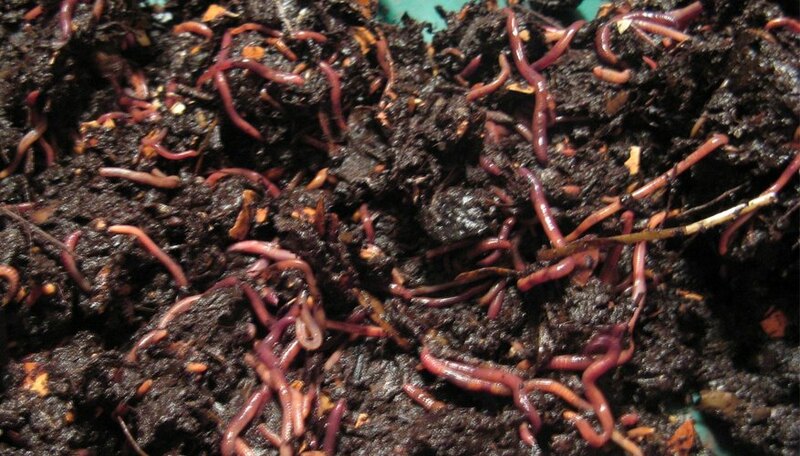 Worms are available to order online from various retailers; buy one pound of worms for every half pound of kitchen waste you produce daily. When placed in the container, the worms will immediately move down into the bedding. Add the first meal of kitchen scraps to one corner of the bin; rotate corners every time you feed the worms. (Do not feed animal products such as meat and cheese or any oily food scraps; these will attract pests to your bin. Dog and cat feces should never be used in worm composting.) Place the lid with ventilation holes on the bin. Harvest your compost when the contents of the bin appear brown and crumbly, like soil. This may take 3 to 4 months to happen completely, or you can harvest as you go, though you may accidentally take some worms with you into your garden using this method. To harvest the entire bin and retrieve your worms for a fresh bin, put the compost in cone-shaped piles on sheets of newspaper outside in the light. The worms will move toward the center of the newspaper. You can then retrieve them and add them back into your container with a fresh set of bedding, leaves and soil, then begin the composting process all over again. Use the rich and highly nutritious compost on all your plants. Worm composting can be done even in a small apartment. Just make your bin a size that fits your available space, and downsize your worm population and scrap feeding appropriately. Even with a small bin, you can dispose of at least some of your kitchen scraps--reducing your overall waste--and generate compost that you can use on houseplants or container gardens. Be sure to place your finished worm composting bin in a well-ventilated and easily accessible area. You can keep the bin indoors--it won't smell if you're doing it right--or outdoors, but be sure to shield the bin and your worms from direct sun and extreme temperatures. Do not feed your worms animal feces. Though it's tempting to get rid of your dog or cat's waste this way, their feces can contain diseases that can infect humans. Feces are generally not recommended for composting, except when using compost pile methods that generate extremely high temperatures that can kill these organisms. Worm composting is not appropriate for composting feces.